The early-winter drowsiness has passed, the holiday hoopla has died down, and the New Year brings in gradually longer days, with more time to enjoy outdoor activities. There's a crisp, clean winter ambiance in the air, too—one that comes with a drop in temperatures and often clearer skies than earlier in the season. Read on for our tips on how to make the most of this quiet, but decidedly charming, time in the French capital. The first month of the year in the French capital tends to be cold with occasional spells of icy rain. Snow is rare at this time of year, but when it does come, it tends to melt fairly quickly, leaving a slushy mess. This is why being well-prepared will ensure you stay warm, high and dry. January in Paris is generally pretty cold, and it's not uncommon to see the mercury dip below the freezing point, and wind chill can make the cold seem considerably more biting. Make sure you line your suitcase with plenty of warm sweaters, coats, scarves, warm socks, and a hat that will protect your ears and head. Pack an umbrella that can withstand a wet, gusty day even if there's no rain in the forecasts. Although heavy rains are less common in January, Paris is well known for its erratic and sudden downpours. Make sure to pack a good pair (or two) of waterproof shoes. Shoes with good tread and grip are important, because the streets can be slick and icy in January. Especially when exploring hilly areas like Montmartre, wearing proper footwear will ensure you don't take a slide (or worse, a fall). When there is snow, it tends to melt when it hits the ground, creating potentially treacherous icy and slushy terrain. This is why high heels and dress shoes are not ideal for walking around the city in January—at least not for any length of time. Bring a pair of high-quality gloves to make sure you don't let cold hands distract you from the sights. They may not be necessary in the end, but they're good to have on hand. Think about packing a few books and magazines you've been dying to read in case you decide to spend a cozy morning or afternoon reading in a cafe. If you're planning to hit the winter sales in Paris, you should consider keeping your cash safe with a high-quality money belt worn under your clothes. These belts can be perfectly discreet, but allow you to feel much more secure with your money. While January is a quieter time of year in the capital, there's still plenty to do, especially if you enjoy more low-key, contemplative activities. We recommend some of the following annual activities, and you can also consult our full guide to January events in Paris to beeline to the best exhibits, shows, and other happenings during your trip. Soak up some art and culture. 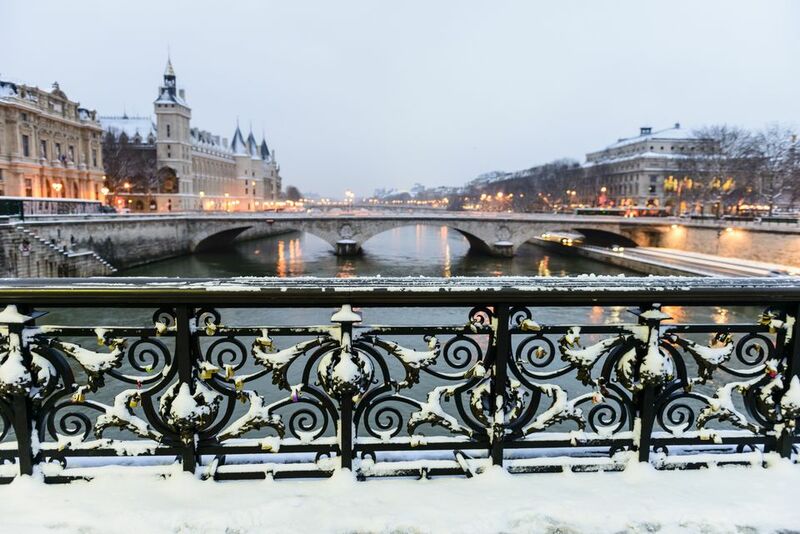 Because tourism is in low-tide mode compared to the spring or summer, visiting January in Paris also provides great opportunities for really lingering in some of the city's best spots for art and culture, such as the Musée d'Orsay or the Centre Pompidou. You'll finally be able to take as much time as you want contemplating your favorite paintings or monuments. Linger in a warm café or tearoom. January is also a great time to spend time in the warmth and charm of Paris' many charming cafes, so be sure to pack plenty of books and magazines for your trip. And If you're interested in Paris intellectual history, cafe-hopping in the city's historical Latin Quarter or in Saint-Germain-des-Prés would be a great way to spend part of a day.Why not visit some of the cafés where legendary writers such as Hemingway, F. Scott Fitzgerald, Simone de Beauvoir, and James Baldwin spent their days working on novels and arguing with one another? Hit the winter sales. Recovering from their holiday excesses, Parisians flood the streets and well-heated terraces to reunite with friends, and, of course, to hit the winter soldes (sales), a French ritual that borders on cultish. For shopping addicts, January is definitely a great time to be in the city of light. There are a few ways to ensure your trip this month is both memorable and minimally stressful. Take advantage of low-season prices. Since this is low season in Paris, you should be able to get a good deal on flights in January, especially if you reserve tickets and packages at least two or three months ahead of your trip. Avoid Paris if you aren't a cold-weather person. If you dislike cold and wet weather, enjoy lots of sunny outdoor activities like picnics and boating, and prefer to visit a city when it's at its most open and dynamic, you might want to consider visiting later in the year. Some activities are best left to other times of year. While most major attractions stay open, some amenities and sights are less attractive in the late winter period. For example, you'll certainly still able to take a boat cruise on the Seine, but with icy winds coming off the river, it won't likely be as pleasant. Since the days remain shorter in January, you'll have less time for day trips and other outdoor adventures. Of course, this gives you the perfect excuse to explore the city's excellent nightlife, from top-rate cocktail bars to wine bars where you can enjoy a simple glass alongside a yummy cheese platter. It's also a good excuse to linger indoors in cozy tearooms, sipping delicious brews and tasting French pastries. Life is hard, right?